Sophomore quarterback McKenzie Milton shined in yet another game this season, throwing for 324 yards, passing for two touchdowns, and rushing for one. It was a dominant performance on both ends of the field for UCF, and once again, the Knights proved to be a team that not only is a contender in their conference, but in the NCAA as well. It was the third consecutive game the Knights’ offense had over 500 yards. The last time that happened in the program was in 1998. 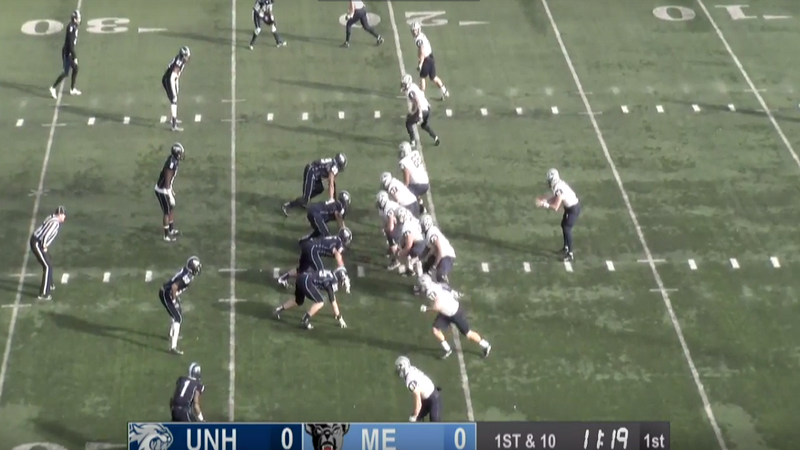 In Saturday’s win, the Knights put up 603 yards. What we learned: This UCF offense is efficient. 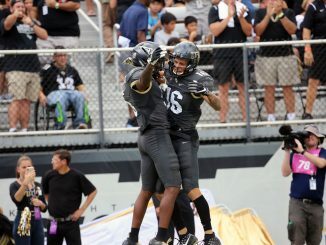 Last Sunday, according to the NCAA, UCF was named the number one scoring offense in the country. The Knights lived up to this standard again Saturday night, dropping 63 on a ECU defense that has already struggled to keep teams off the field during the first half of this season. The Knights even had a trick up their sleeve, throwing a 4-yard pass to senior defensive end Jamiyus Pittman for his first touchdown ever. On the ground, sophomore running back Adrian Killins Jr. ran three-yards for a score. With 40 seconds left in the first half, junior running back Taj McGowan had his turn. Freshman quarterback Noah Vedral even joined in on the fun and rushed for his first ever collegiate touchdown. Freshman running back Greg McCrae also scored, marking his second rushing touchdown of the season. It was the most points the Knights put up in a game since they put up 63 against Liberty back in 2001. What went right: Time after time this season, a deep ball from Milton has found the hands of a receiver and into the end zone for the score. On the opening drive of the game, Milton threw a 48-yard pass to senior tight end Jordan Akins to put the Knights up 7-0. 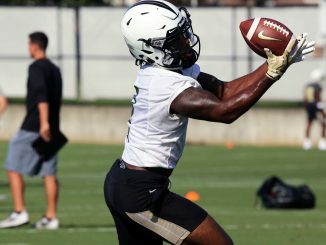 With touchdowns on their two opening drives Saturday night, the Knights had a streak of 10 straight scoring drives, including drives from their previous game against Cincinnati. All of last season, Milton only had three multiple touchdown games. This year, he already has four. What went wrong: When a team wins by 42 points, it’s hard to pin point negatives on their performance, but the Knights seemed to struggle with the “little things” in Saturday’s game. UCF took the ball all the way down to the one-yard line, only for McGowan to fumble. It was moments like that where the Knights appeared to lose focus, and against a stronger team, could possibly cost UCF a game. 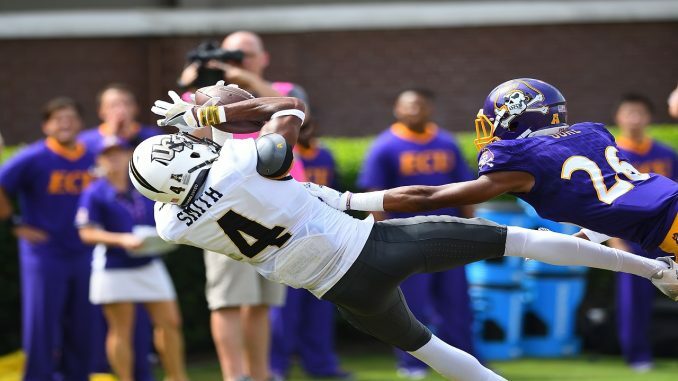 Offensive Player of the Game: All eyes were on Milton as the Knights pounded ECU, and almost every time he had the ball in his hands, he was able to make a play. Throwing for 324 yards and passing for two touchdowns was not where it ended though. Milton even took one in for himself untouched to add to his already impressive resume on the night. Defensive Player of the Game: Just joining the team in early August has had no effect on how junior Mike Hughes has played this season. In addition to playing safety, Hughes also returns punts for the Knights and took one home for 66-yards on the night. Earlier in the game Hughes took one all the way down the field, but it was called back due to an illegal block in the back. He was hungry to get a second chance. Up next, UCF travels to Navy next Saturday for a 3:30 p.m. kickoff.